Once a small band of heroic adventurers, the toll of countless years have hollowed them terribly, and will throw themselves at any intruder they see in an attempt to end their life. Both can be found near the gravestones after entering the Cave. Unlike most boss fights, there are three characters you must defeat in order to progress. Cerah the Old Explorer switches to an Estoc if forced into close combat. Keep moving, use the terrain and the whole boss area to your advantage. Varg and the Graverobber will chase you. Lead them around and take a shot or two at Cerah before the other two catch up then run a lap around when they do. Repeat this process to avoid being ganged up on. Poison works well on Ancient Soldier Varg. Have enough poise to not get stunlocked by Cerah's Estoc if you try to take him on in close combat. Drop from a ledge to a watery level below to buy some time for healing. Guard breaking them will give you an opening for a melee attack. Cerah has low resistance to Bleed and takes a large amount of damage from it. Bleed damage also is effective on Afflicted Graverobber, although it takes longer to build. Beware trading hits with him, as his own bleed damage on you can build much more quickly. Never assume that whatever weapon you have will poise-break Varg. His poise is much higher than one might expect. Attempting to parry Varg is advised against, as only certain attacks from his Dragon Tooth can be parried and he shows little to no indication as to which he'll be using. All three of these enemies can cancel out of nearly all animations, whether attack or block or stagger, so beware. They can retaliate and recover much faster than is natural. Pyromancies should be used quickly if any are available, as if any of these three end up in the water beneath the main arena, they'll gain a huge fire resistance. This generally isn't a problem with Cerah considering he tends not to follow you. Varg's attacks are easily rolled away from (rolling forward and to his right seems to work best), leaving him vulnerable to devastating backstabs if Graverobber is not nearby. Use of summons to distract either makes this much easier. The extra damage against hollows on the Old Whip will affect these three and can deal huge chunks of damage to them with each hit. On the right hand side of the arena is a small pit filled with water into which you can drop and escape via a nearby ramp. If you enter it and stay in the water, Varg and the Graverobber will always move around to the same spot to drop in and follow you. Drop in near to the ramp, and they will run around, granting you valuable seconds. You can use this time to heal, or to draw the two into the pit giving you a few seconds to exit and attack Cerah uninterrupted. After Cerah is dead, you can use this technique to try and separate the Graverobber from Varg, allowing you to attack him alone in much the same fashion. When only Varg is left, use the two levels of the ramp to get easy hits on him as he follows you. If fighting with summons, use of the Redeye Ring to draw attention will allow the host/summons to easily backstab Varg and Afflicted Graverobber while the bait kites them. It also allows one player to kite 2 of the 3 enemies, leaving the host 1v1 or 2v1 against Cerah if you are worried about the Greatbow. If coordinated properly, this strategy all but trivializes this boss fight. Unlike the appearance, Afflicted Graverobber is female and will groan in hollowed female voice when hit and staggered. They are capable of backstabbing you; Ancient Soldier Varg's backstab will likely kill the player in one hit, as can the critical damage from Cerah's Estoc. 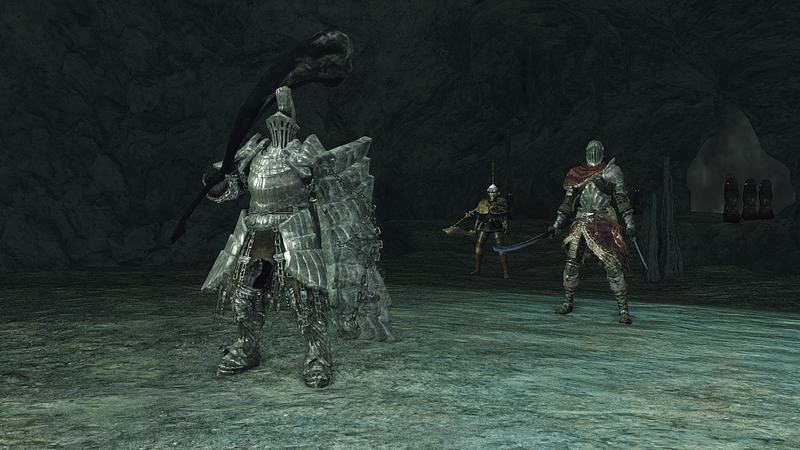 When fighting these bosses they may drop various DLC exclusive items such as the Puzzling Stone Sword. In Co-op this allows people who do not own the DLC to have access to such items. Ancient Soldier Varg will start using Estus Flasks at less than half health. He has 7 flasks in total.